There's much more to rhodies than the plain-Jane pink types! Head out to the Early Rhododendron Show this weekend for a glimpse into the fascinating world of species rhododendrons, which come in myriad interesting forms and colors. The Pacific Northwest is renowned for luxuriant plantings of jewel-toned rhododendrons growing in nearly every established garden and park in the region. To some, the Rhododendron might even rival the rose as the most iconic and vibrant floral symbol of the typical rainy, gray Portland spring. This very weekend brings the annual Early Show and Plant Sale plant showcasing odd, new and early-blooming species rhododendrons - as well as spring's cheeriest flower, the daffodil - in the idyllic setting of the Crystal Springs Rhododendron Garden. Rain or shine, it's a beautiful start to the fun, flowery part of springtime in the Pacific Northwest. Rhododendron growers from around the Willamette Valley supply the Rhododendron Society with an array of interesting plants for sale. And there is expected to be a huge display of daffodils, as well as cut daffodils for sale at great prices. 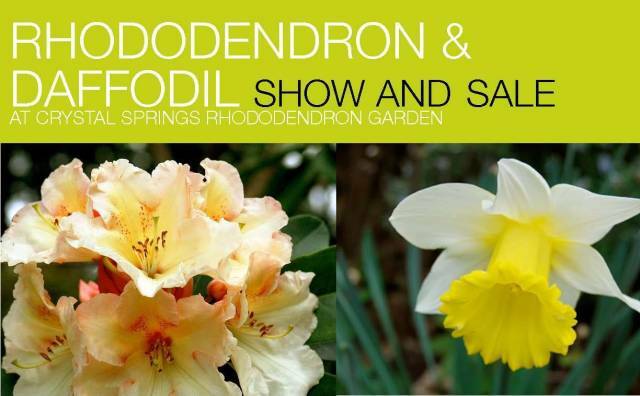 Presented jointly by the Portland Chapter of the American Rhododendron Society and the Oregon Daffodil Society, the Early Show includes an opportunity for the general public - that includes you! - to enter flowers in the show. Even if you aren't a flower show-off, it could still be fun to help your kids or neighbor or grand-parents enter their blooms. Inviting amateurs to enter their home-grown flowers in flower shows is a marvelous, old-fashioned tradition and it's high time people got involved! To enter your flowers in the show for judging, just bring them to the exhibit hall Friday evening from 6 to 8 pm or Saturday morning from 7 to 8:30 am. Call 503-771-8386 if you have any questions about how to enter your flowers in the show. Don't be shy - it's old-fashioned, nerdy fun and there could be prizes for the winners! The same weekend at Crystal Springs, check out the Oregon Daffodil Society's show and sale, running from 10 am to 5 pm Saturday and Sunday. WHEN: Saturday April 6, 2013 - show from 9 am to 12 noon, with sale and show displays from noon to 5 pm; and Sunday April 7, 2013 from 9 am to 5 pm. The Oregon Daffodil Society event runs concurrently from 10 am to 4:30 pm each day. For more information about the sale or to learn more about rhododendrons, go to the Portland Chapter of the American Rhododendron Society or call 503-771-8386. Heads-up: the Mother's Day Rhododendron Show and Sale takes place Saturday May 11 and Sunday May 12, 2013. There are three times as many plants for sale, from Rhododendron growers around the Willamette Valley, but you won't find so many unusual early-blooming varieties at that later sale. Note: parking can be a bit of an issue at Crystal Springs Rhododendron Garden - be prepared to park in the designated West Reed College parking lot that weekend or, if signs are out indicating it's permitted, park on the street.